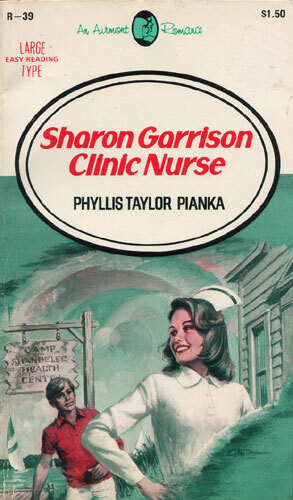 Young Sharon Garrison was eager to start work as head of the clinic at KSEA-TV Media Center. She would be responsible for the running of the entire clinic and the care of all those who worked at the center. Her association with Mercy Hospital had ended on a sour note, after her Uncle Elliott Garrison had been named hospital administrator. Suddenly friends and acquaintances treated Sharon with exaggerated caution or as if she could directly influence hospital policy, and the young nurse had felt it best to look for a new position. Sharon quickly became involved in the center and caught up in its excitement. Charming and capable, she won the respect and affection of Skip Richardson, Production Manager, who was eager to give her a screen test, and Paul Hamilton, the handsome boss of KSEA-TV. Misunderstandings seem to be the rule rather than the exception in Sharon’s love life, however, and it is not until the exciting climax that the young nurse’s future seems certain.